TOOTH GERM: #Tubuleslive Event: Laser Periodontics - Where a Scaler and Blade Just Won't do. #Tubuleslive Event: Laser Periodontics - Where a Scaler and Blade Just Won't do. This week's #Tubuleslive Event held at Henry Schein was led by Dr Rana al Falaki - Laser Periodontiics: Where a Scaler and Blade just won't do. 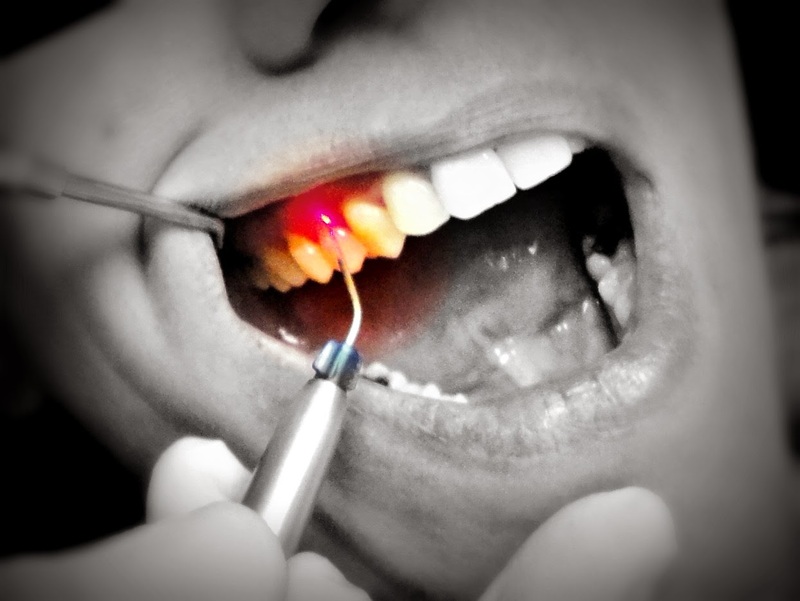 The use of Lasers in Dentistry is rapidly expanding but is not something many undergraduates learn about when at Dental School. This event has opened by eyes to the many uses and evidence of the effectiveness of lasers in the field of periodontology and it is certainly something that I would be interested in learning more about, not only in this area of dentistry, but in other areas such as restorative dentistry and oral surgery. The most challenging aspect of managing periodontitis is reducing the risk of relapse. Risk factors for periodontitis include: smoking, diabetes, nutritional deficiencies, stress and genetics. Lasers are more patient friendly, less expensive, are faster, have better visibility and have the potential for regeneration. Regeneration is most predictable in 3-walled defects and class II furcations. Other uses of lasers include gingivectomies, crown lengthening surgery, fraenectomies, grafting, non-surgical apiecectomies, vestibular deepening, restoration of biological width and management of peri-implantitis. There is a 30% incidence of peri-implant mucositis and peri-implantitis, although this varies according to which study you look at. I think the most exciting thing I took away from the talk was the potential for tissue regeneration which I think could revolutionise the field of periodontology in future! The next #Tubuleslive event will be next week the 13th of November: Ridge Preservation with Professor Nikos Donos. Why not attend the live audience where you can get FREE CPD! Register online and I hope to see you there! Have you had experience using Lasers in practice or would like to start using them on patients? Please comment in the section below! To see my other posts about previous #TubulesLive events see here.